As a long-term client, Unidev has helped The King and Prince Beach & Golf Resort with a holistic digital marketing strategy that includes everything from pay-per-click (PPC) solutions to social media consulting. The King and Prince Resort maintains a very active YouTube Channel where they showcase their stunning resort property, the beaches and scenery of St. Simons Island, and area activities. 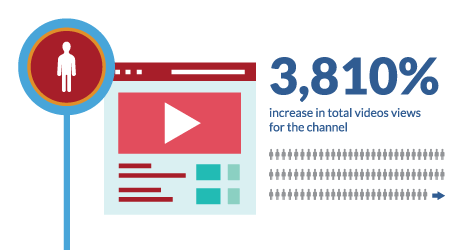 While their videos are popular, especially when promoted through their other social media channels, a boost was needed to push their videos to maximum visibility and increase reach across YouTube. As the world’s second largest search engine, with billions of videos being watched daily and over 1 billion active users per month, YouTube presented a huge opportunity for reaching The King and Prince’s customer base. As part of a blended PPC and social media strategy, Unidev launched a paid YouTube initiative to promote a specific video showcasing the property as an ideal location for a destination wedding. Unidev launched a YouTube campaign targeting a specific audience based on geographic region, age, and interest and tested this campaign over a three week time period. The video was shown as both an in-stream video (shown before other videos and views can choose to skip after 5 seconds or continue watching) and as an in-display video (an ad unit with an image thumbnail of the video and up to three lines of text). 3,810% increase in total videos views for the channel. 142% increase in average view duration. 42,065% increase in watch time on the promoted video. 12,311% increase in views on the promoted video. These huge jumps illustrate the quick and effectual results from a targeted YouTube campaign, at a much lower CPC than other platforms, with an average cost per view for $0.05. This type of promotion is ideal for branding, boosting reach across YouTube, and blasting out a new video to a target audience. To find out how Unidev can assist you with YouTube Campaigns, contact us today.